We've just come back from a weekend in Wales (visiting the incredible Portmeirion Village, the setting the brilliant TV series The Prisoner ), and while there we picked up a couple of these bars of Kendal Mint Cake. For those who haven't tried it, Kendal Mint Cake is a delicious minty sugar and glucose bar. It was famously eaten by Sir Edmund Hilary and Tensing Norgay (or Sirdar Tensing as the copy on the packaging has it) on their expedition to the summit of Mount Everest in 1953, and ever since has been a staple foodstuff for hikers, climbers and mountaineers. We'd only been aware of the Romney's version of the bar, but it turns out that it is currently made by three manufacturers in the small Cumbrian town: Romney's, Quiggin's, and Wilson's. The recipe was originally accidentally created in 1869 by a chap called Joseph Wiper, while trying to make clear glacier mints. His great nephew Robert Wiper spotted the bars' potential as an energy food, and supplied them to the 1914-1917 Transarctic Expedition under the command of Sir E Shackleton. 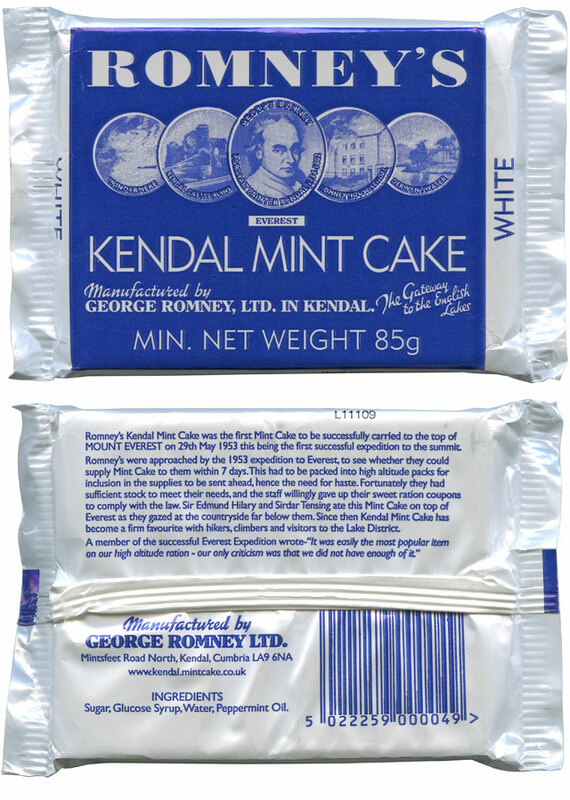 Wiper's was bought in 1987 by Romney's, who had been producing their own mint cake since 1936 - Romney's now produce lines of both types of Kendal Mint Cake. Quiggin's have been producing their mint cake since 1880, so they claim the title of being the true home for it; while Wilson's have been making it since 1913.